Read this article to learn about some of the most popular silver bullion investment options on the market. 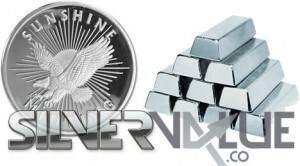 Silver is always a popular investment since the buy-in for silver is reasonably affordable for even the entry level investor and, on the whole, metals are considered a fairly safe investment for long term investors. Granted, the silver market does have direct ties to the gold bullion market, but with industrial uses for silver that don’t exist for gold and a much lower buy-in, silver bullion is quite often a much more palatable alternative to gold. When it comes to buying silver bullion, you have a few options available to you. While some involve actual physical ownership of silver in one format or another, a couple involve paper investments instead. Bars – Silver bullion bars are available in several different types and sizes. The most popular bar for collectors are the custom minted bars made by everyone from government mints to small private firms. Most often, these are 1 ounce bars and are a very inexpensive way to start investing in silver bullion. Also, bars that weigh 100 ounces and even 1000 ounces are available. Most of these usually only have a hallmark denoting purity and weight. Bullion Coins – Many government mints and private firms also produce silver coins designed to be used as an alternative to bar stock. In values from $1 to $50, these coins not only have a direct tie to spot silver bullion pricing but, in some cases as with commemorative coins, actually have value as coinage as well which improves the return on your investment. While not as compact as bar stock, coins have a bit more “back story” which gives coins a bit more value than straight bullion. Silver Options – This is a contract that gives the holder the right to purchase a certain amount of silver at a fixed price in the future. The holder can opt not to purchase the silver if the price of silver doesn’t move the right way, conserving capital and only losing the value of the transaction fees and contract fees. Silver Futures – While similar to an options contract, this does obligate the trader to purchase silver within the timeframe of the futures contract. While this can work well if the price of silver has dropped and is trending higher, this can lock a trader into a high price if silver has moved higher. Silver ETF – This is a special type of stock which gives you ownership of silver without having to deal with the inconvenience of storing and handling silver bars or bar stock. Valuation for an ETF is strictly tied to spot prices and the overall idea is to give you the ability to own silver without any of the inconveniences. Silver is a great way to enter the metals investment markets. However, as with any investment, there is a distinct possibility for loss, just as there is with actually earning a decent ROI. Unless you simply plan to buy in now and keep your investment for an extended period of time, you’ll want to pay close attention to the current silver market to ensure you do have positive gains.